In the previous English post we saw a type of chaincase made of celluloid. 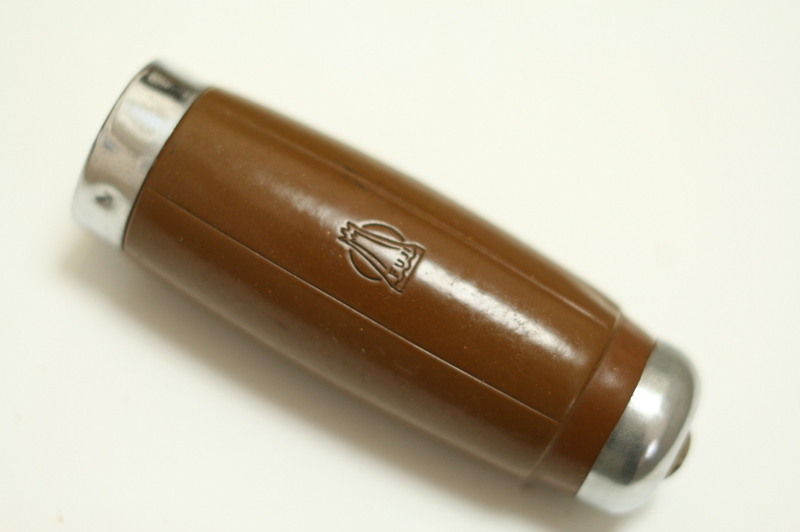 This material, first registered in 1870 was widely used as a substitute for ivory. 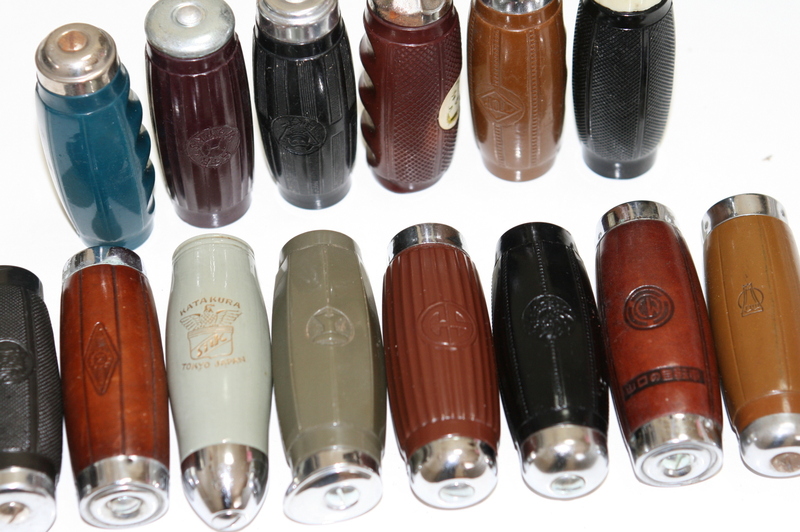 On bicycles of the 1950s many of the handlebar grips were made of celluloid. Today this material is rarely used but still can be found in products such as fountain pen cases, ping-pong balls and guitar picks. 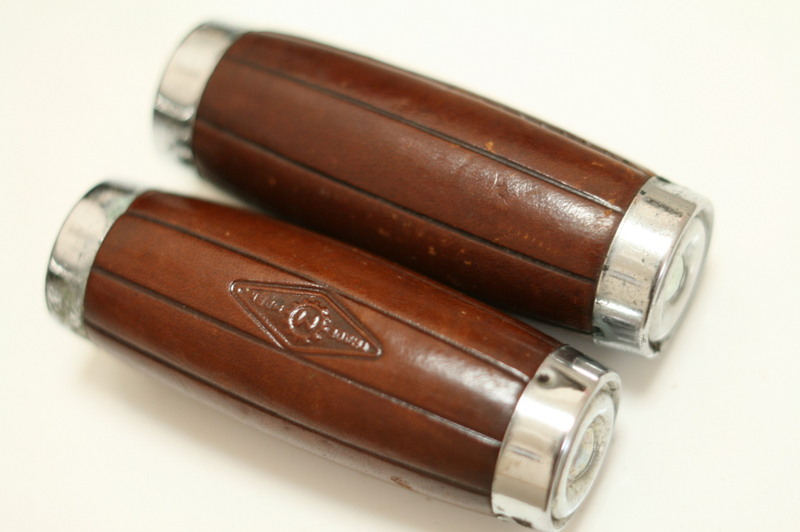 But 60 years ago celluloid was a popular materials for hanglebar grips. Let's take a look at few pairs. 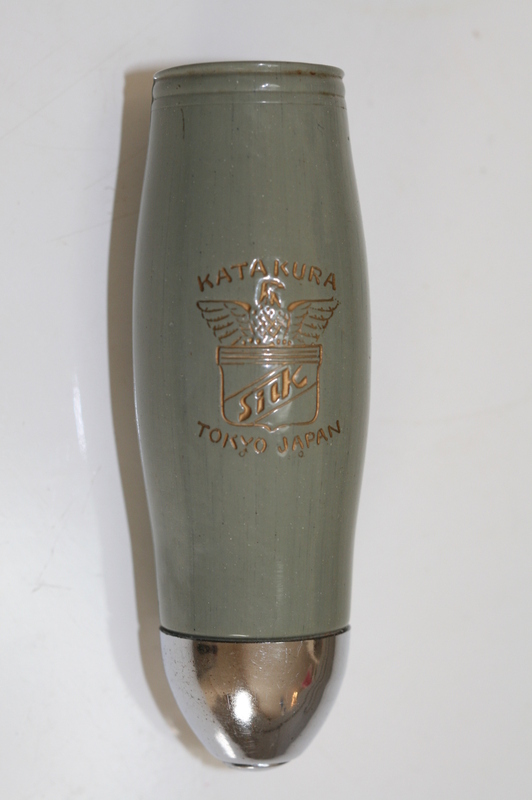 Note the molded "pistol grip" feature on this pair of original grips bearing the CS (SEKINE Bicycle) logo. The chrome plated collar ring and end-cap add a touch of class. This pair has the ONI or "demon" from Nichibeifuji (Fuji). It always amazes me that manufaturers back in the 1950s put their logo or name on nearly every part. Here's a close up of that "demon". 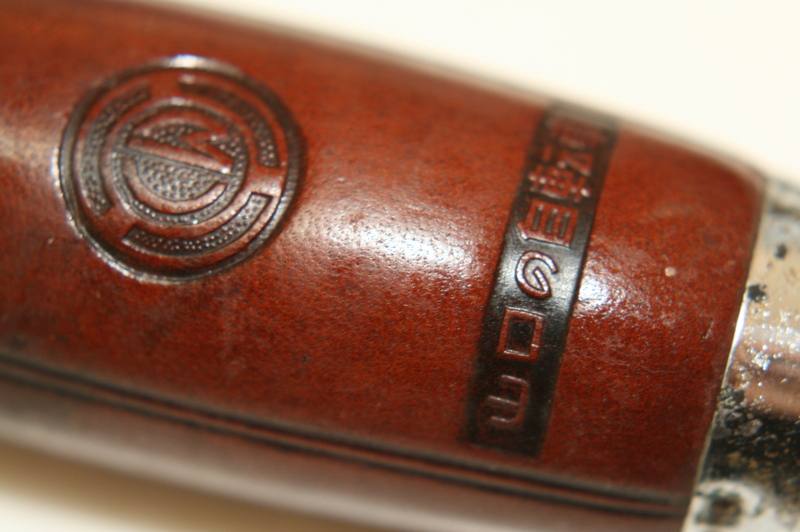 On a typical bicycle from this period you can easily find the manufacturers logo/name on over 60 different places! Even on the tiny screw heads that attach the fender stays to the fenders. 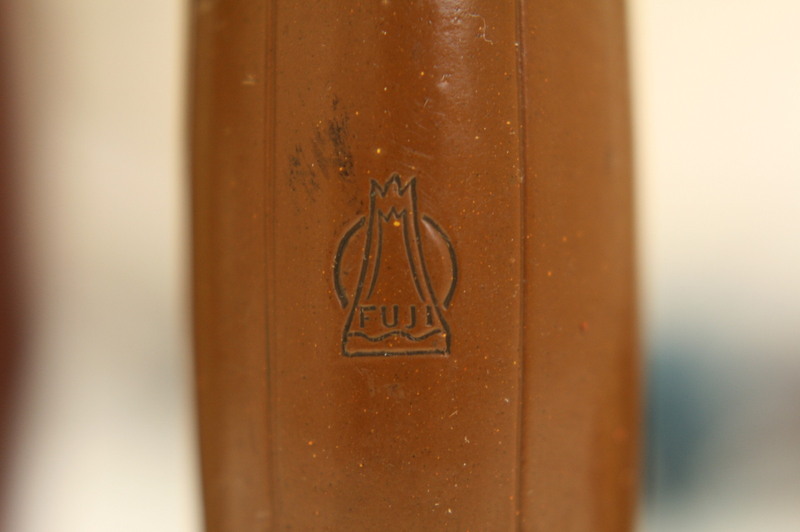 Here is an example with the infamous FUJI tradmark. 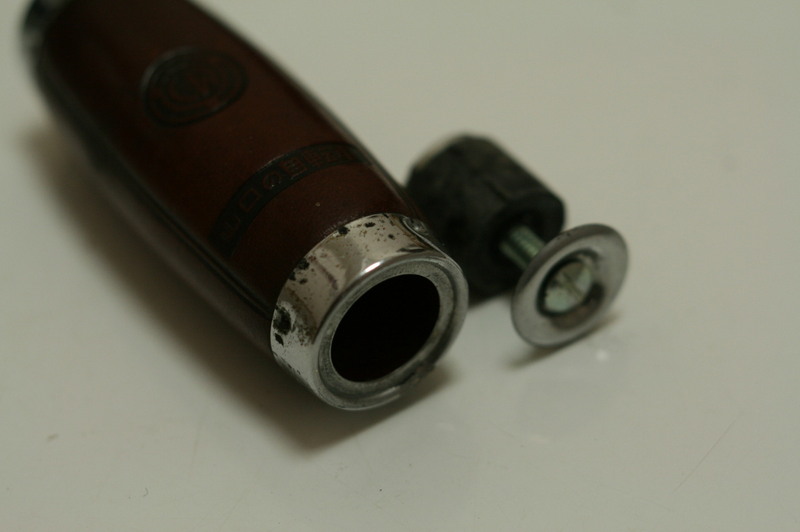 As celluloid can crack replacements grips were common. 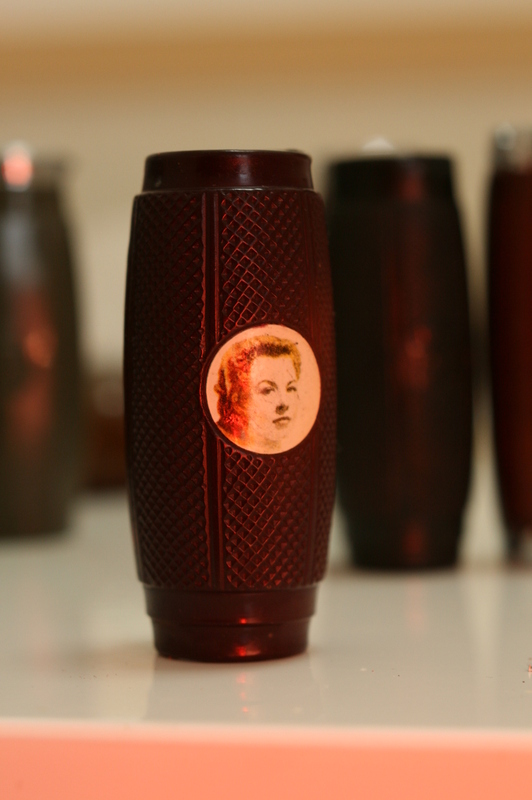 A popular motif was the faces of pin-up girls, these can also be found on bells from the same period. 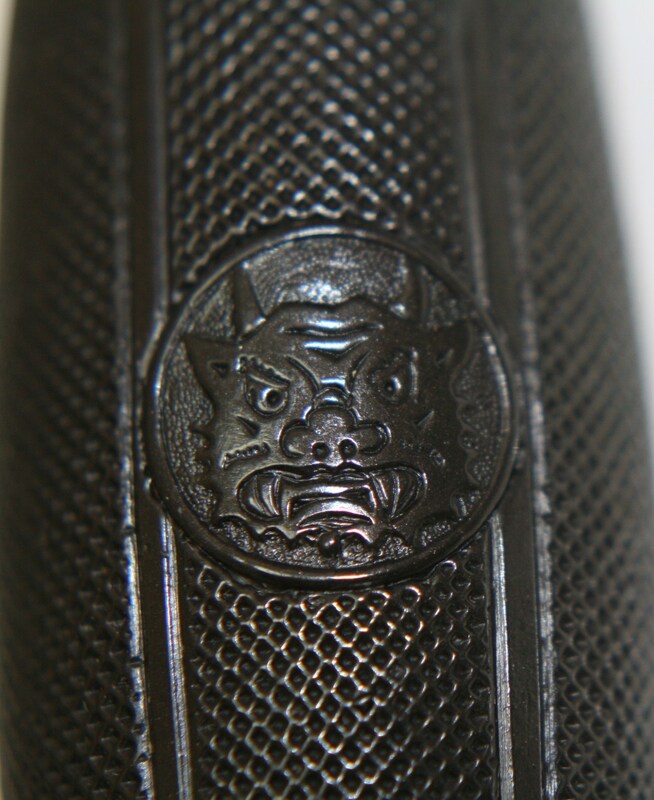 A pair of HIKARI grips. 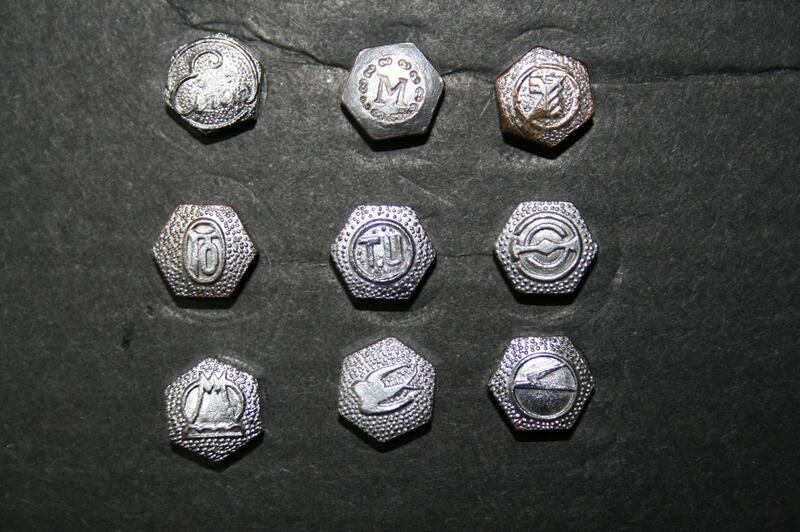 These were actually a present from a fellow collector. I aim to use these to complete a restoration project of an original HIKARI frame. 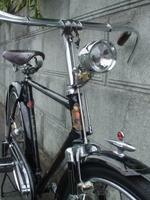 Over the past two years I have acquired original rear brake & hub, handlebars, saddle, mudflap, bell and fender ornament. 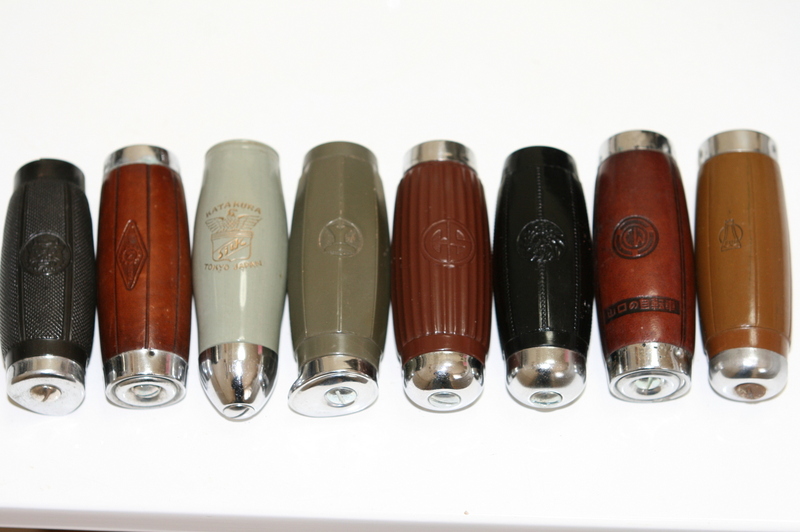 I would like to find a set of fenders and chaincase, but the chances of acquiring these are pretty slim. The frame is about 60 years old so sooner or later I will have to compromise and settle for something close. 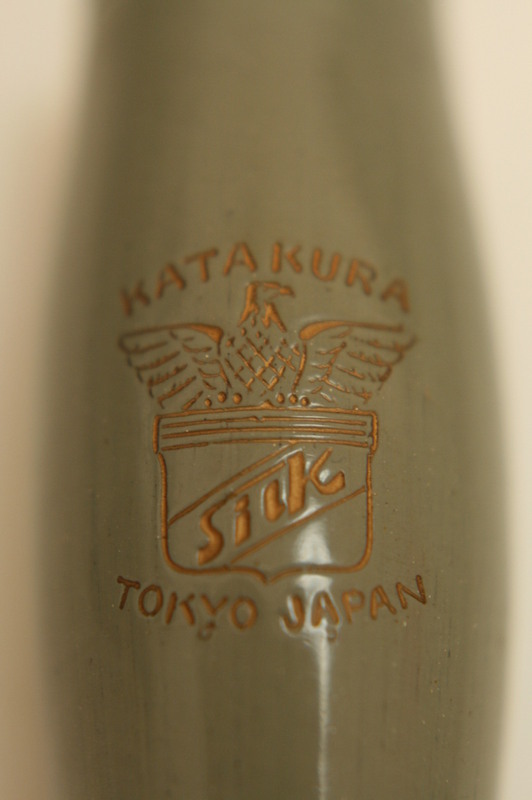 Close up of the HIKARI trademark. 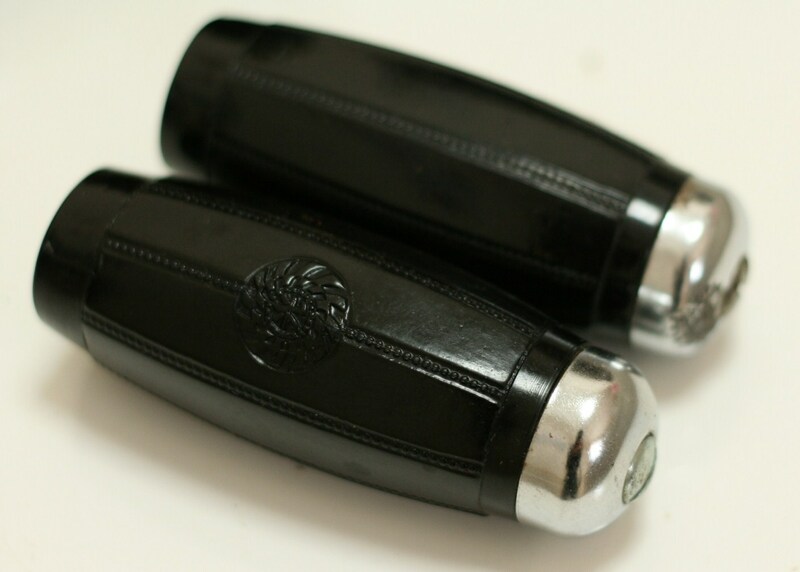 A fine pair of high-end tapered "pistol grip" handlebar grips. 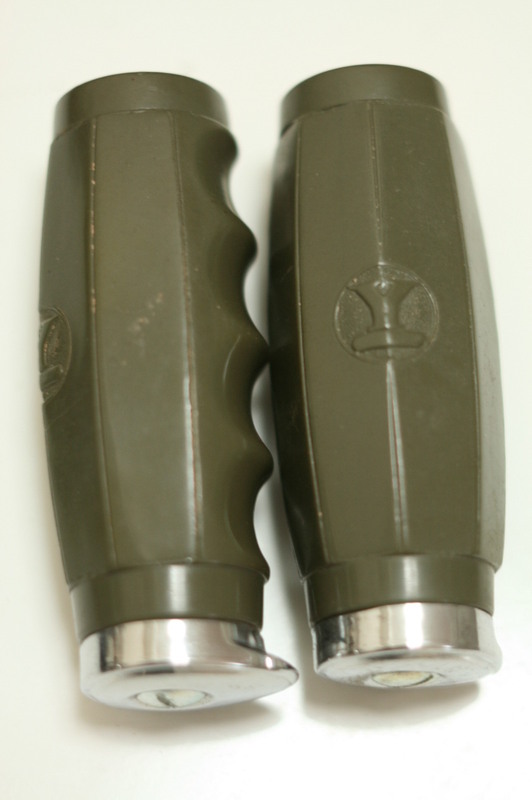 Note the cone shaped end-caps. 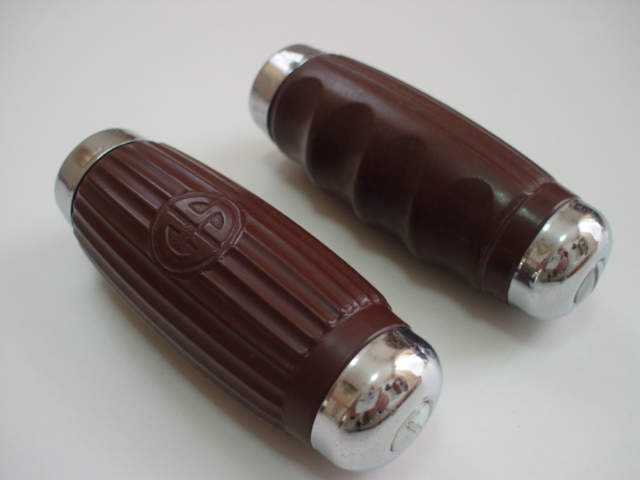 A nice pair of YAMAGUCHI (captital "Y" in the circle) handlebar grips. 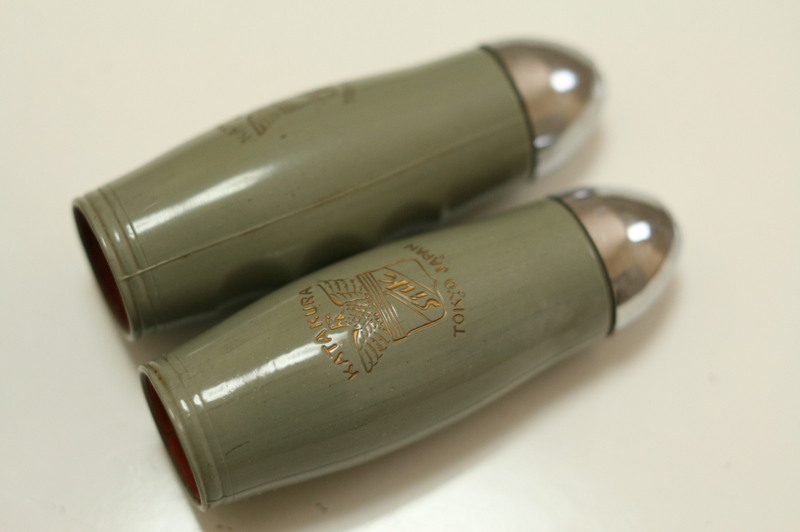 Note the tear drop end-caps. 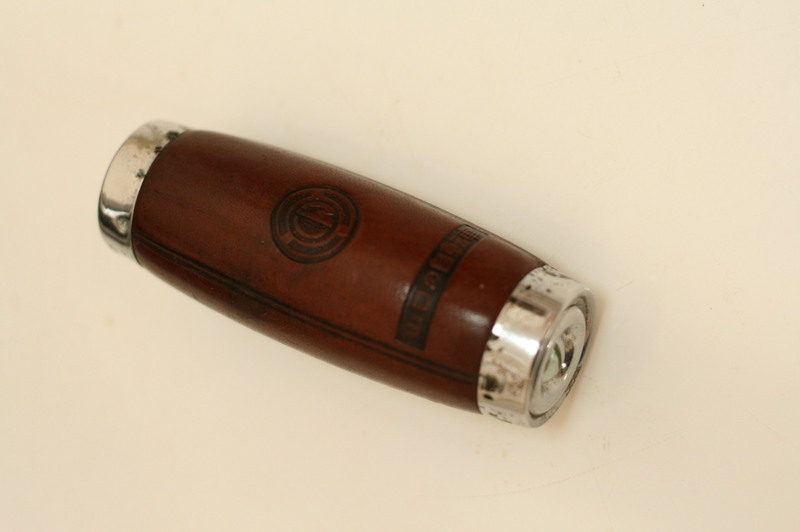 Leather was also used and stretched over celluloid shell inserts. Let's finish this post with a grip nothing short of pure art. 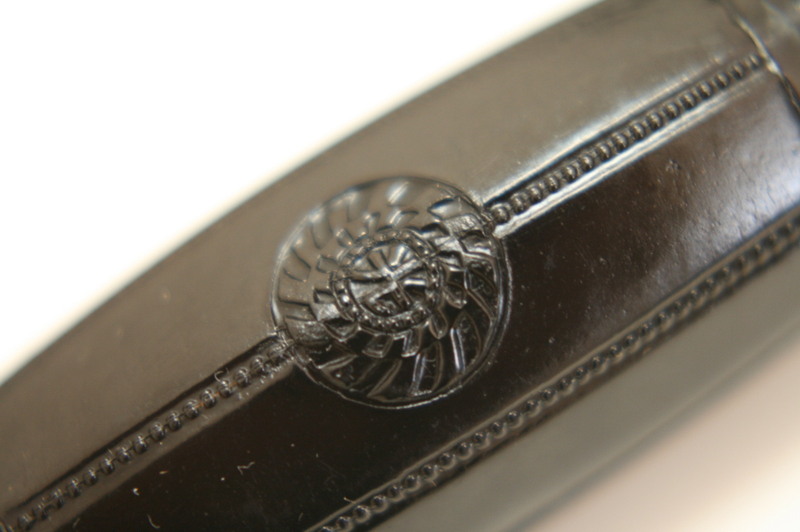 Leather stretched over a celluloid insert bearing the YAMAGUCHI Bicycle Corporation logo. 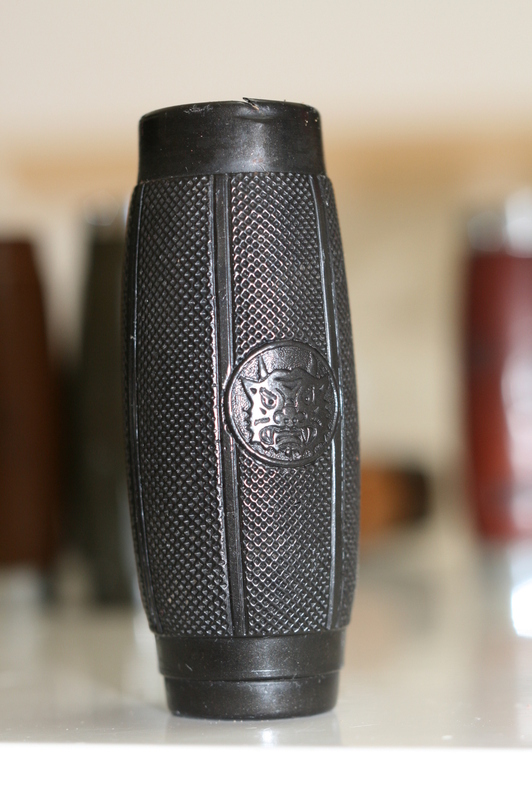 The grip proudly bears both the manufacturer's name and logo. Yamaguchi used two logos a capital "Y" within a circle, and, the "CW" shown here. 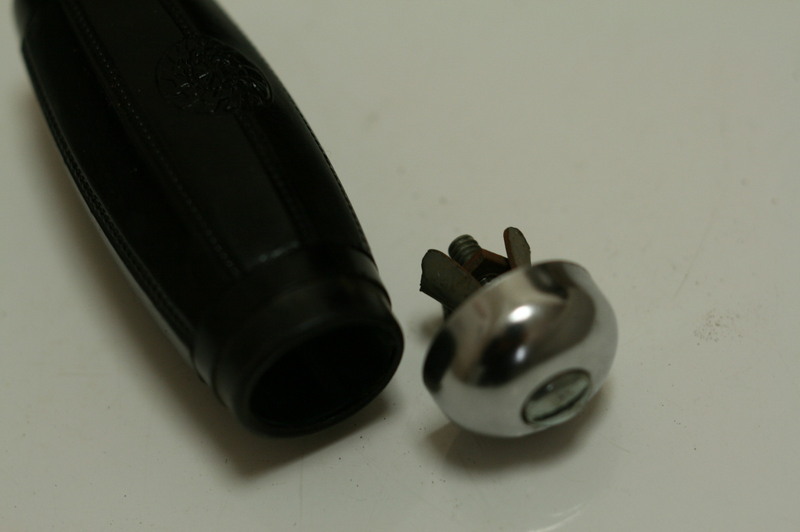 Note that the collar ring and end-cap cannot be removed as they hold the stretched leather in place. 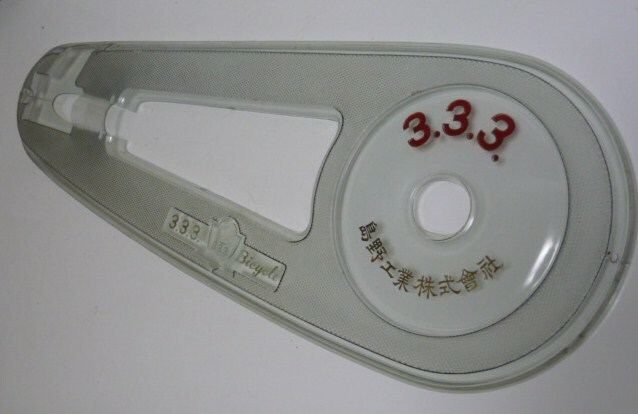 Thus, the unique expander bold design which simply acts as a lid. Compare the standard end-cap below, to the one above. This end-cap designfits over (caps) the end of the celluloid grip. Also, the more common type of expander bolt which secures the end-cap in place can be seen. Kindly note that the next post will be the Japanese version of this one. I will be back with a new post in English soon. Until then "stay trued" and "happy wheels". Really nice collection. The quality of these pieces continues to impress in so many ways. Always impresses me espescially since they were made over 50 years ago. Hi! 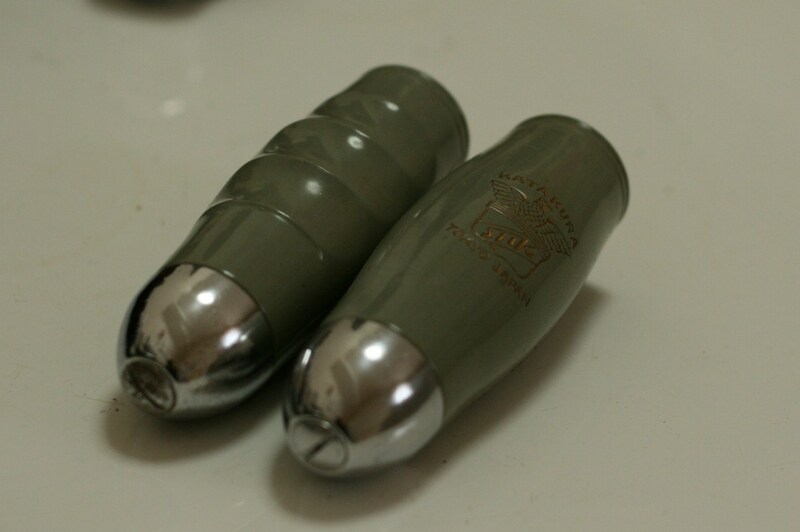 I just bought a pair of vintage Ukai grips from ebay for my project. The grips are in 7/8" size so I assumed they fit on 22.2mm bar. These grips have cardboard sleeve inside the grips and not solid plastic. At first it seemed tight - more like 22.0mm so I soaked the grips in water attempting to peel off one layer of cardboard and, alas, the water became red from the dye or glue on that cardboard sleeve and after having peeled off the cardboard the grips are now too loose for the 22.2mm bar. How was I supposed to mount the grips (have the metal screw and expanding rubber insert like what you have) and if I was supposed to mount the grips while wet are they supposed to stay on while riding in the rain? Did I miss something? Pardon the late reply busy with the holidays and just now catching up on emails.